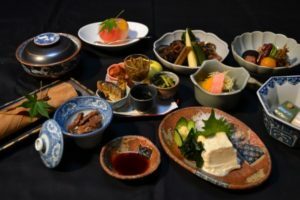 We, Miboro Ryokan offer home made meal cooked from scratch with the harvest form the mountains, seasonal ingredients, and local products. 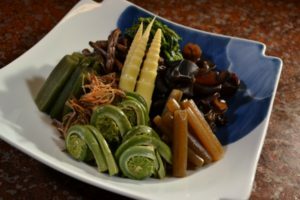 Dinner is served as a traditional Japanese multiple course dinner, mainly wild plants /mountain vegetables. Ingredients and menu may change depending on seasons. 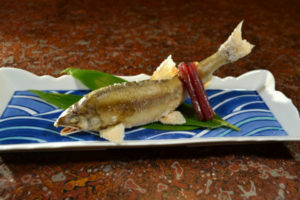 This “Hosho-maki” is specialty of the owner. 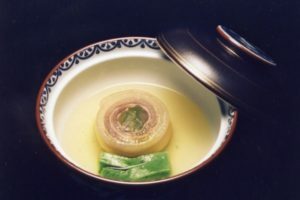 Hida-Beef Shabu-shabu, a Japanese hotpot dish of thinly sliced meat and vegetables boiled in water which tastes very well with the homemade sesame sauce. Speciality from Hida area, “Hooba Miso” (miso=fermented soybean paste) served for breakfast. It is slightly sweet. 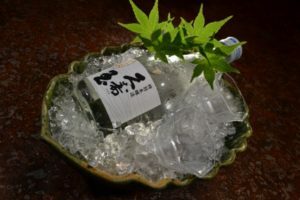 We recommend “Kusudama”, famous and quality sake from Hida Takayama. 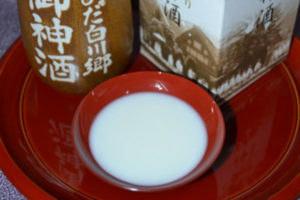 Please enjoy “Doburoku”, unrefined sake, speciality from Shirakawa-go during the festival season in October. We crop wild plants / mountain vegetables in spring. 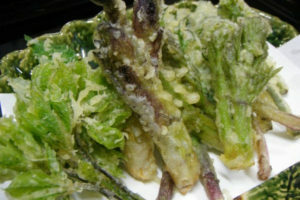 Free tempura will be offered when ingredients are available. ※ We serve Koshihikari Rice produced in Fukui prefecture. 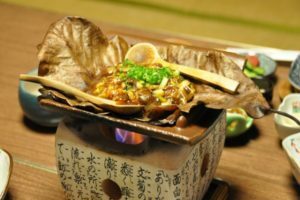 ※ Menu may change depending on the season. salted grilled fresh water fish, and food / broth steamed in an earthenware tea pot. ※ Please do not hesitate to ask for cerebrating birthdays, wedding anniversaries, sixtieth birthdays, and etc. 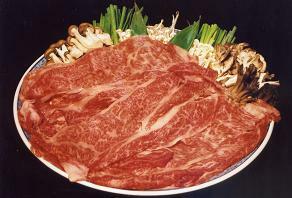 ※ We accommodate as much as possible for food allergies.